How on earth am I going to make a proper apple strudel with gluten-free flour? This was a question I was long pondering about. Of course, Austria without apple strudel would be like Italy without pizza. So I knew, one day I had to find out how to make one. Gluten-free, mind you. The classic Austrian strudel dough is not rolled out but stretched (like pizza dough) and it needs to be paper thin. But, of course, without gluten in the flour, the dough does not stick together. So every time I tried, the strudel dough either turned out much to thick or ended up having plenty of holes. Then I read about teff flour and its slightly jellylike consistency, which makes it a good binding agent for baking. This sounded like teff flour could be a very useful ingredient for flexible doughs like a strudel-dough. So I gave it a try. To make sure that the dough really holds together, I not only used teff flour but also white rice flour and a little bit of locust bean gum powder at the beginning. This mixture was quite OK for the first day. But when my kids complained about a more or less rubber-like texture of the strudel dough the next day, I knew I had to change something. After all, apple strudels are supposed to be crisp and tasty. So after trying some more I ended up with the following recipe for apple strudels which I think is really nice. My kids are happy about the crisp and tasty gluten-free apple strudel, and so am I. Ingredients for the dough: teff flour, psyllium seed husk powder, salt, apple vinegar, canola oil and water (gluten-free apple strudel). First, put the dry ingredients of the dough (teff flour, psysllium seed husk powder and salt) in a bowl and mix it (best use an electric mixer). To enhance the stickiness of the dough you can optionally add 1/2 tsp. of locust bean gum powder (or xanthan gum powder) to the dough. This improves the handling but may decrease the crispiness of the dough, though. Then, pour the liquid ingredients of the dough (water, canola oil and apple vinegar) into a small jar and mix it. All liquid ingredients should have room temperature. 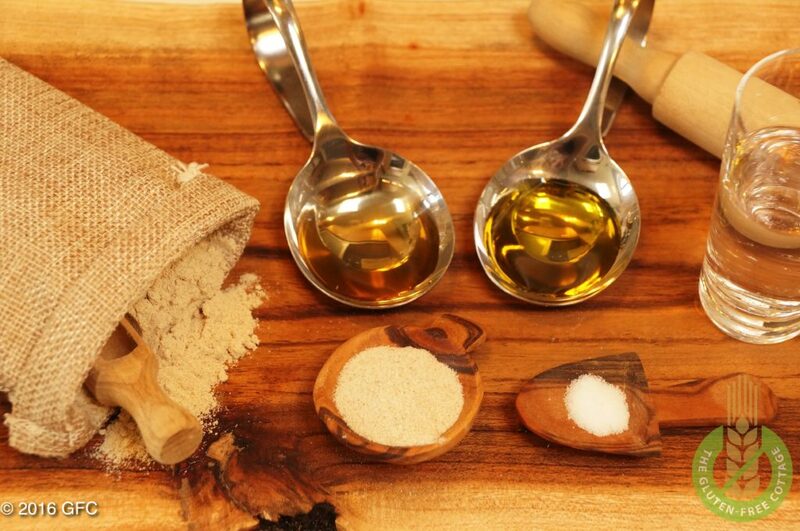 Vinegar is needed because it adds elasticity to the dough (it cannot be tasted in the end product). Now add the liquid dough ingredients to the dry dough ingredients and mix it thoroughly for about 2 minutes. The dough needs to rest now (gluten-free apple strudel). Take the strudel dough out of the mixing bowl and place it on a surface covered with teff flour. Knead it shortly with your hands until a nice firm loaf emerges. Put the loaf in a small bowl, sprinkle it generously with canola oil and put a plastic foil on top so that the dough does not get too dry. Let it rest for about 1/2 hour at a lukewarm place. 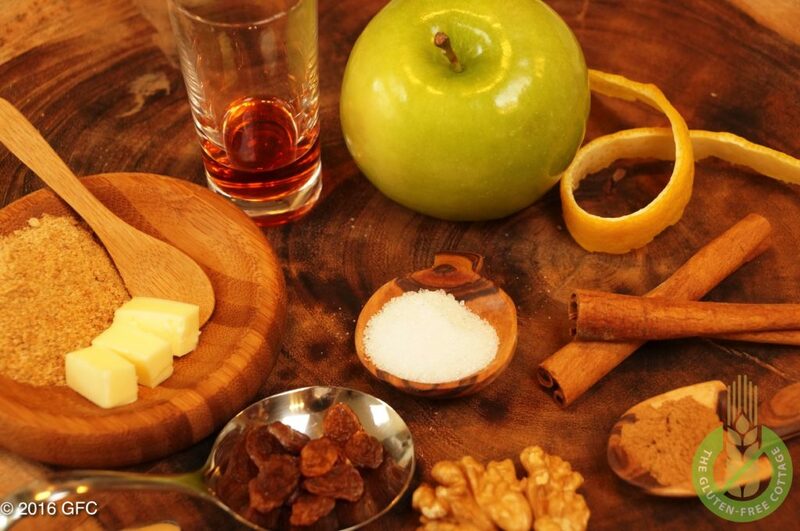 Ingredients for the filling: apples, lemon juice, gluten-free bread crumbs, unsalted butter, granulated sugar, cinnamon powder, dried raisins, rum and walnuts (gluten-free apple strudel). In the meantime start preparing the filling. Begin with washing the dried raisins and put them in a small bowl. Sprinkle the dried raisins evenly with rum and let them soak. Preparation for roasted gluten-free breadcrumbs (gluten-free apple strudel). Now let the butter melt in a big enough frying pan and add the gluten-free bread-crumbs. Let them roast for about 3 minutes until they develop a nice brownish color and a pleasant flavor. As soon as they are finished take them out from the pan so that the roasted breadcrumbs do not continue to darken in the hot pan and burn. Let them cool. The apples need to be peeled and then coarsely sliced (gluten-free apple strudel). Peel and quarter the apples and remove the core. 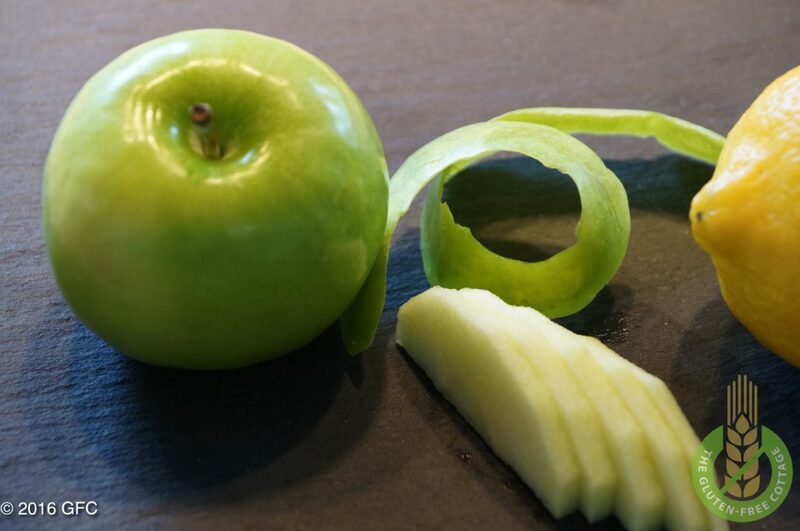 Cut the apple quarters into coarse slices of about 3 to 5 millimeter (≈ 1/8 in.). Pour the lemon juice over the apple slices and mix it carefully. The strudel dough is rolled out between two parchment papers (gluten-free apple strudel). Take the dough out of the bowl and put it in the middle of a large enough parchment paper. Place another parchment paper on top of the dough. 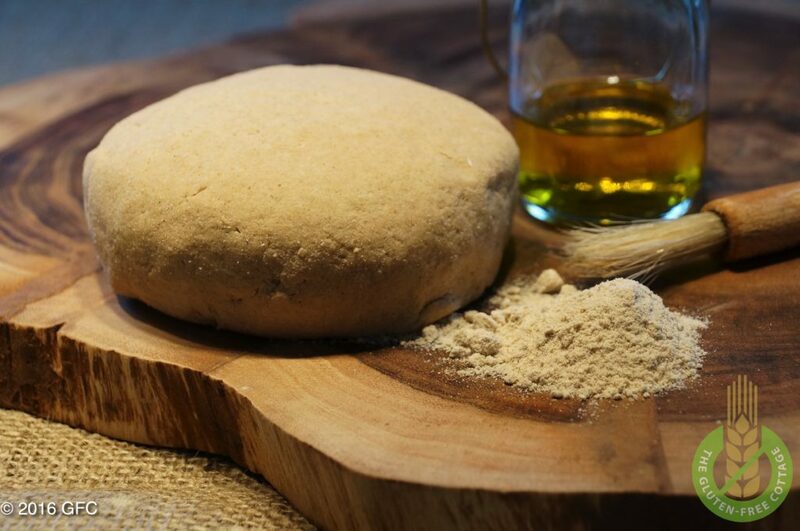 Take the rolling pin and start carefully rolling out the dough in a square until it is approx. 1 millimeter [≈ 1/16″] thick. Covering the dough with non-stick parchment papers on both sides prevents the dough from being torn apart during the roll-out process. The filling covers about two thirds of the apple strudel dough (gluten-free apple strudel). Now remove the parchment paper on top of the dough (place it on the baking sheet) and cover about 2/3 of the rolled-out dough with the evenly spread roasted bread crumbs. Place the apple slices on top of the bread crumbs, then spread the remaining filling ingredients (white sugar, cinnamon powder, raisins and walnuts) evenly on top of the apple slices. Take about one tablespoon of the melted butter used for the coating and spread it evenly on the remaining 1/3 of the dough (best use a pastry brush). Now take the two lower ends of the (underlying) parchment paper and carefully make a roll of the dough. Be careful not to dislocate the filling. Place the finished apple strudel roll very carefully on the baking sheet covered with the second parchment paper. 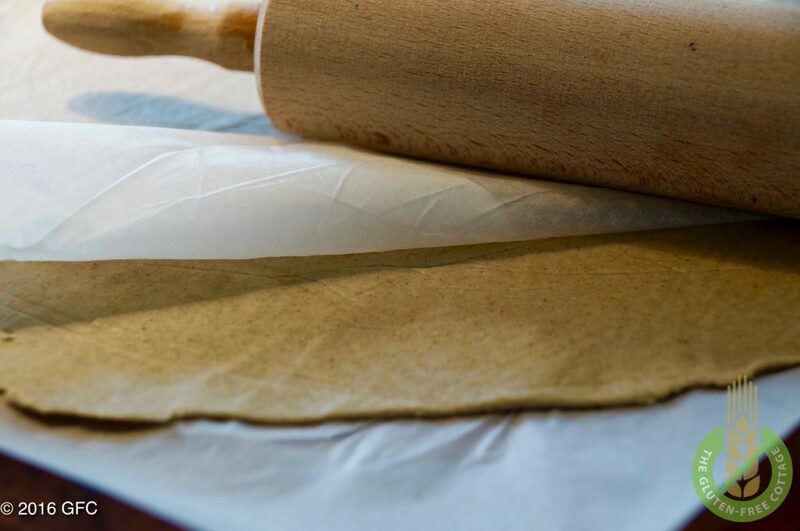 To prevent the dough roll from tearing apart when moved, it might be a good idea to move it together with the underlying parchment paper and then let it slowly roll on the prepared baking sheet. Spread the rest of the melted butter very generously over the apple strudel (butter makes the dough crisp). Place the apple strudel for about 35 to 40 minutes into the lower part of the oven. Take it out when the ends of the apple strudel appear slightly brownish and let it cool. As teff flour has a quite dark color you may need to be more watchful than when using other flours for baking. 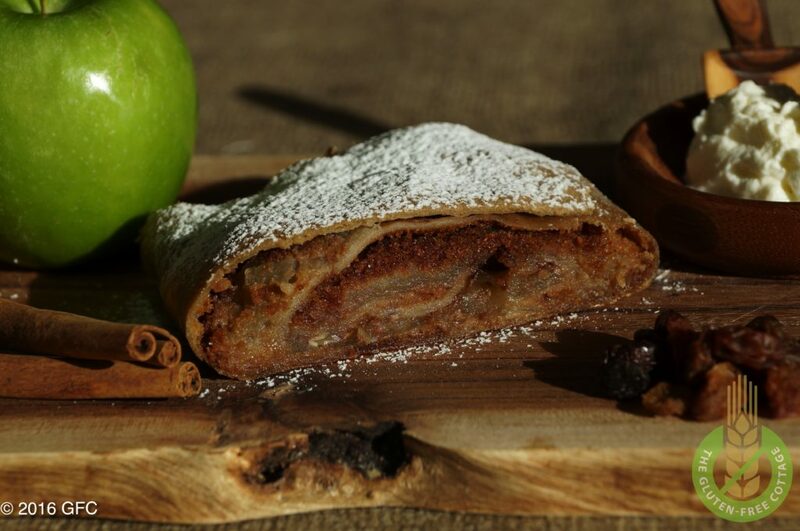 Apple strudel is best served at a temperature slightly above room temperature. Cut the apple strudel into pieces and generously add white powdered sugar on top immediately before serving it. Serve each portion with a few tablespoons of whipped cream on the side. In Austria, quite some people not only add a little bit of granulated sugar but also one or two teaspoons of rum when whipping the cream. 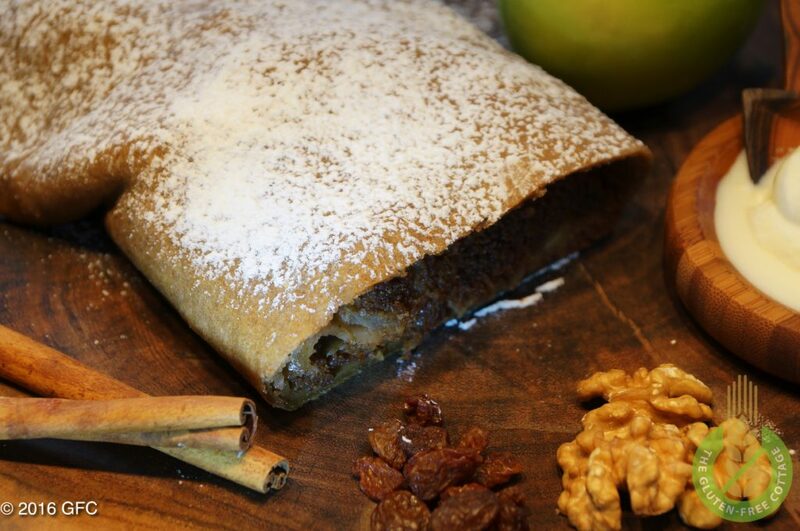 Enjoy your crisp and very tasty gluten-free apple strudel! 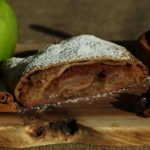 Apple strudel is typically served with whipped cream (gluten-free apple strudel). Preheat oven to 200 °C (390 °F) top and bottom heat. DOUGH: Place “dry ingredients” in medium bowl and mix (best use an electric mixer). Pour “liquid ingredients” in small jar and stir. Combine dry and liquid mixtures and mix thoroughly for about 2 minutes. Scrape dough out of mixing bowl, place on floured surface and knead shortly by hand. Make loaf. Put loaf in small bowl, sprinkle with canola oil and cover with plastic foil on top. Let rest for 1/2 hour at a lukewarm place. FILLING: Wash dried raisins, place them in small cup, sprinkle evenly with rum and let soak for 10 minutes. 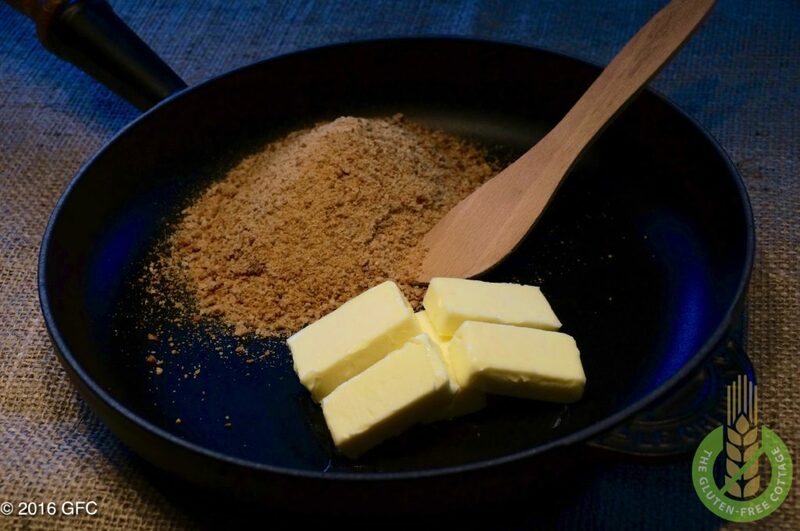 Melt butter in frying pan and roast gluten-free bread crumbs for about 3 minutes until brownish. Take out and let cool. Peel and quarter apples and remove core. Cut apple quarters into coarse slices. Sprinkle evenly with lemon juice. Take dough loaf out of bowl, remove plastic foil, place on surface covered with non-stick parchment paper, also place one sheet of parchment paper on top, and and roll out in a rectangle of 1 millimeter [≈ 1/16″] thick. Remove parchment paper on top and place on baking sheet. Spread roasted bread crumbs evenly on two thirds of dough rectangle. 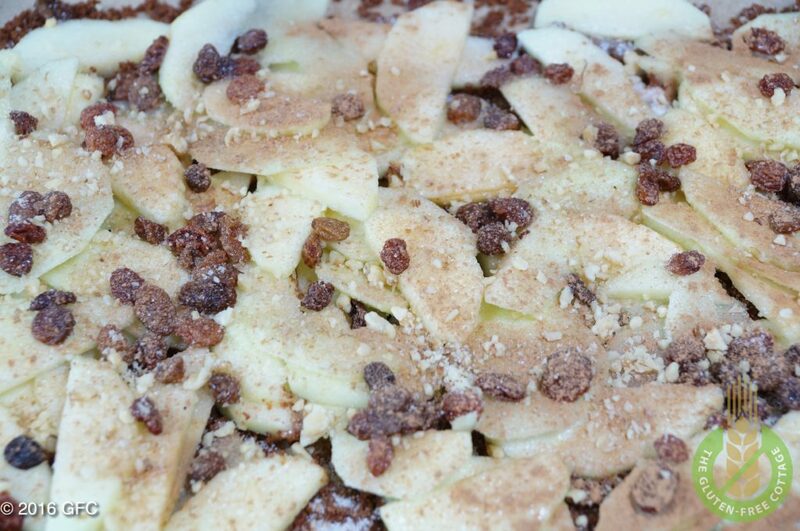 Place first apple slices and then white sugar, cinnamon powder, raisins and walnuts on top. Use pastry brush to brush rest of dough (one third) with one tablespoon of melted butter. Use underlying parchment paper to make a roll of the dough and help place it on baking sheet (also being covered by parchment paper). . Spread the rest of melted butter very generously over the apple strudel (butter makes the dough crisp). BAKING: Bake 35 to 40 minutes at lower part of the oven. Serve warm with conditioners’ sugar on top and whipped cream on the side. I was excited to see your recipe, my grandmother always made us ‘Cottage cheese’ Strudel’ so I’m excited to try your pastry dough with this different filling. Have you ever made it this way? Hi Michele, thank you very much! 🙂 No, I have not tried it yet with another filling but I would be glad to hear from you when you use your granny’s cottage cheese filling. Sounds delicious! The dough stuck terribly to my parchement paper and I wasn’t able to roll it without it breaking, had to throw it all away. Was update since I was planning on making this for my mother’s birthday. Hi Diana, I am really sorry to hear that you had trouble with the stickiness of the dough. 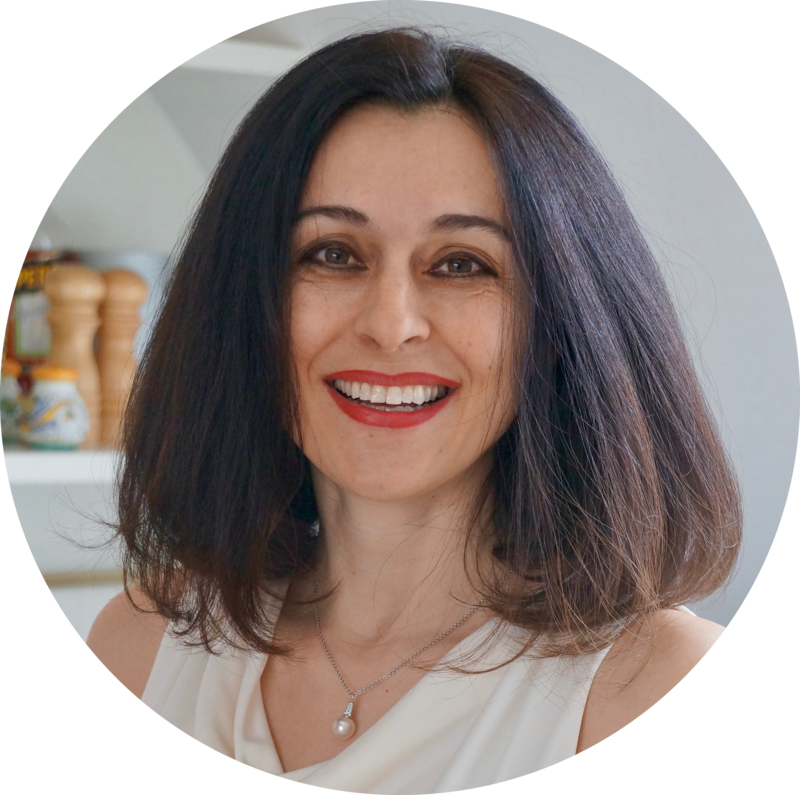 I know it can be very tricky sometimes to work with gluten-free dough as it breaks very easily – especially when making strudel dough which needs to be really thin but at the same time needs to stick together (though lacking gluten). What you could do is spread some teff flour beneath and on top of your dough when placing it between the two parchment papers. Please let me know how this worked out for your dough. Thanks and have a great day! Hi, can I replace the canola oil with avocado or olive oil?